What Wiselot and fellow Ron Paul delegates had experienced was a memorable display of the Republican Party’s fetid essence. 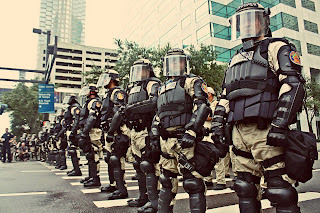 The tactics employed by the GOP establishment to isolate, intimidate, and ultimately to expel Ron Paul delegates were the natural product of the party’s totalitarian genetics. By using criminal means to impose a monolithic, top-down process in which an entrenched oligarchy can re-write the rules to suit its whims, the Republican Party was simply living down to its odious pedigree. From its inception, the Republican Party has been devoted to a doctrine properly called national socialism – the fusion of politically favored corporate interests with national bank and an all-powerful, militaristic central government. This is why Dr. Paul’s noble attempt to cultivate a liberty movement within the GOP was ultimately as futile as seeking to create life in a test tube. As Dr. Thomas DiLorenzo documents in his slender but potent volume Lincoln Unmasked, a century and a half before the lamentable advent of Barack Obama “The Party of Lincoln set out to fundamentally transform the American government from a decentralized confederacy of sovereign states to a consolidated, monolithic empire.” The mission of the GOP, in a single phrase, was to supplant the republic with a reich. Mussolini would later digest that formula into a single pithy prescription: Everything within the State, nothing outside the State, nothing against the State. Witness the fact that objections by Paul delegates on the convention floor were shouted down by mouth-breathing party cadres chanting “USA! USA! USA!” (A more appropriate refrain, given the Party’s emphasis on unity uber alles, would have been: “Ein volk, ein reich, ein fuhrer!”) Also of note were the Soviet-style methods used to suppress even the audible mention of Ron Paul’s name during the convention’s roll call. “It’s a totalitarian process,” lamented Yelena Vorobyov, a disillusioned 30-year-old Ron Paul delegate from Minnesota, referring to revised party rules – enacted by a patently fraudulent voice vote after key potential dissidents had been detained or effectively abducted -- that stripped all power from state parties. What the RNC accomplished in Tampa is best captured in another German expression – Gleichschaltung, the “coordination” of all activities under the control of the party’s central committee. 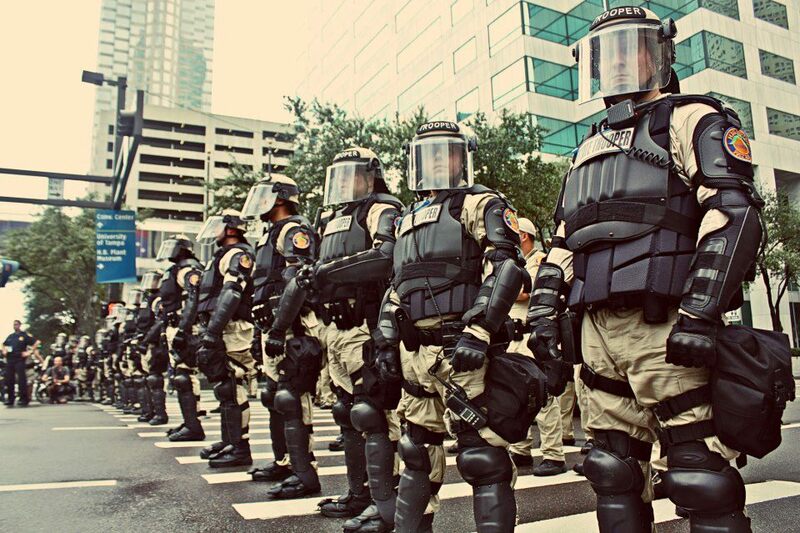 What happened in Tampa was a relatively genteel version of the undisguised Brownshirt-style thuggery that had been employed by Party operatives during the primaries. 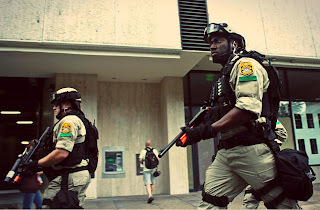 Witness what took place during Louisiana’s state GOP convention on June 2, where Henry Herford – the convention’s duly elected chairman – was feloniously assaulted by a thugscrum of four Shreveport Police Officers, who acted on the orders of the Quisling faction within the state Party. Herford was hospitalized for a dislocated prosthetic hip. In keeping with standard procedure, the uniformed assailants filed spurious charges against the victim. Herford, who underwent a CAT scan on his hip and received a painkiller injection, didn’t sign his arrest papers. “I can’t sign anything while I’m on a narcotic, and I told the police that,” he explained. Alex Helwig, a Ron Paul delegate and Chairman of the Rules Committee, made a formal motion to remove the chair. 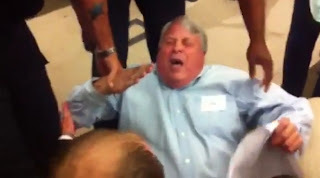 In a fashion reminiscent of a third world dictatorship, Helwig was seized by Shreveport Police and removed from the room. During his brief detention, Helwig suffered several broken fingers – a punishment favored by Mussolini’s Blackshirts – and when he returned to the event he walked with the aid of a cane. What happened in Louisiana was a detailed foreshadowing of what would later take place at the national convention. Once again, this is to be expected of those who preside over the GOP, which is America’s original socialist party. In their valuable book Red Republicans and Lincoln's Marxists: Marxism in the Civil War, Walter D. Kennedy and Al Benson, Jr. examine the role played by the "48ers" -- veterans of the 18 interconnected revolutions that convulsed Europe in 1848-1849 -- in creating the Republican Party, bringing Abraham Lincoln to power, and conducting the war against the South. Lincoln, who would later slaughter hundreds of thousands of Americans in order to create a unitary national government, offered unqualified support to the proto-Marxist revolution of 1848. “Any people anywhere, being inclined and having the power, have the right to rise up and shake off the existing government, and form a new one that suits them better," he insisted in a January 12, 1848 speech. "Nor is this right confined to cases in which the whole people of an existing government may choose to exercise it. Any portion of such people, that can, may revolutionize, and make their own of so much of the territory as they inhabit." The “48ers,” note Kennedy and Benson, sought to overthrow the existing political order and then consolidate power over larger territories. They weren’t secessionists who sought merely to withdraw from an unsuitable political arrangement, as was the case with the American South. The revolutions of 1848 understandably appealed to the idealistic impulses of people weary of absolutism. But, as Kennedy and Benson observe, this proved to be a familiar bait-and-switch, with those “freed from local decentralized control” were made subject to “centralized authoritarian control" in the name of Democracy. The revolutionaries applauded by Lincoln lusted to reconstruct society through violence. In Germany, the stated objective of the revolution was to fuse a multitude of independent principalities into "a united indivisible republic." Again, this foreshadowed the work of Abraham Lincoln and the party that elevated him to power. When the revolt of 1848-49 was crushed, the "48er" diaspora brought many of the most ambitious and radical of the revolutionaries to the United States, where many of them were instrumental in creating the Republican Party. Several of them -- such as Joseph Wedemeyer, Charles A. Dana, Franz Sigel, August Willich, and Carl Schurz – played prominent roles in the war to conquer the independent South. Dana, a personal friend of Karl Marx and Frederich Engels, was assistant secretary of war under Lincoln. The slogan-spewing herd poisoners who compose the GOP’s media auxiliary routinely depict Barack Obama as the embodiment of an ideology alien to America’s constitutional origins. If such people were burdened with a particle of intellectual honesty, they would recognize that to the extent this depiction of Obama is accurate, he is Lincoln’s true heir. 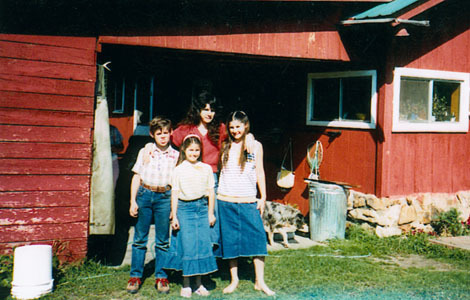 Enemies of the State: Samuel and Vicki Weaver (left and rear-center) pose with Sara and Rachel. Sara Weaver has forgiven the people responsible for murdering her mother Vicki and younger brother Samuel twenty years ago. 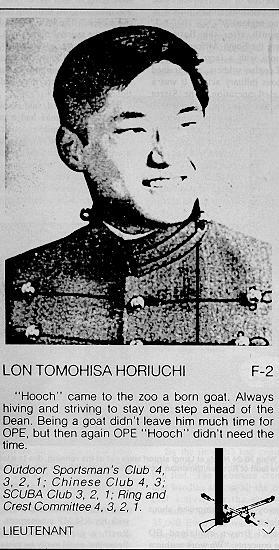 Lon Horiuchi, the FBI sniper who shot Vicki in the head while she was holding a ten-month-old infant, is still being sheltered by the Regime that employed him. If he were any part of a man, Horiuchi would make a pilgrimage to Sara’s home in Montana to express remorse for the crimes he committed against her family. Shortly before he murdered Vicki on August 22, 1992, Horiuchi attempted to murder her husband, Randy Weaver – a man who had done nothing to harm any living soul. Acting under “rules of engagement” that were tantamount to a murder warrant, Horiuchi shot Randy in the back, attempting to kill him instantly by severing his spinal cord. Owing to a last-second motion by Randy, the bullet hit his shoulder and exited his armpit. Randy and a visiting family friend named Kevin Harris fled back to their cabin. Vicki Weaver flung open the door and was shot in the head by Horiuchi. The same round used to murder Vicki ended up wounding Harris. At the time Horiuchi attempted to murder him, Randy was visiting the forlorn outbuilding that sheltered the lifeless body of his only son, 14-year-old Samuel, who had been murdered the previous day by U.S. marshals preparing to ambush the Weaver family. Three of the six camouflaged marshals threw rocks to distract the Weaver family’s dogs. When Samuel and Harris went to investigate, a marshal panicked and shot one of the dogs. After Samuel fired in the direction of the gunshots, Randy told him to return to the cabin. “I’m coming, Dad,” shouted Samuel. At that point, one of the marshals, in keeping with the standards of valor expected of those who serve the federal Leviathan, shot the 14-year-old in the back. For nine days, Sara had to care for her baby sister, Elishiba, as well as her ten-year-old sister Rachel while the shattered body of her mother decomposed in the family’s cabin. Their home – or “compound,” as it was characterized by the criminals who besieged it, and the media functionaries who retailed their self-serving lies -- was surrounded by a small army of federal, state, and local law enforcement personnel. 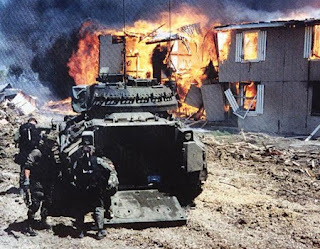 In what could be seen as a foreshadowing of the holocaust at Waco’s Branch Davidian refuge roughly eight months later, the Feds were apparently prepared to fire-bomb the Weaver home, thereby destroying evidence of their crimes. A news crew from KREM-TV in Spokane saw several large canisters of gasoline being loaded onto an FBI helicopter, which took off and circled the cabin – only to veer off suddenly after being videotaped by observers on the ground. Much to the disappointment of the Feds, the standoff ended without additional bloodshed. Randy Weaver and Kevin Harris were acquitted of murder charges arising from the death of William Degan. Randy was found guilty of failing to appear in court to answer a contrived firearms charge engineered by an ATF provocateur who sought to blackmail the ex-Green Beret into becoming an informant. Although the Weaver family eventually received a large civil settlement courtesy of the federal government’s tax victims, neither Horiuchi nor his supervisors – Larry Potts and Danny Coulson -- was ever prosecuted. The Ninth Circuit Court of Appeals, invoking a specious concept it called “Supremacy Clause Immunity,” ruled that it would be impermissible for a federal law enforcement officer to face civil or criminal prosecution for official acts that would otherwise be criminal in nature. Judge Alex Kozinski’s scalding dissent lambasted the court for creating what he christened the “007 Standard” – a license to kill that was issued "to all law enforcement agencies in our circuit -- federal, state, and local." A few months after issuing that ruling, the court modified it to permit the State of Idaho to prosecute Horiuchi under state laws. Denise Woodbury, an assistant prosecutor from Boundary County, was prepared to put Horiuchi on trial, but the prospect of doing so caused incoming county attorney Brett Benson to lose bladder control. Accordingly, the individual who murdered Vicki Weaver and attempted to murder Randy Weaver remains at large. As the indispensable James Bovard pointed out sixteen years ago, the Marshals Service “gave its highest award for valor” to the five surviving members of the home invasion squad that murdered Samuel Weaver. In presenting the award, then-director Eduardo Gonzalez hymned the praises of the “exceptional courage … sound judgment in the face of attack, and … high degree of professional competence” displayed by the agents whose actions precipitated the needless deaths of three people, and the attempted murder of two others. 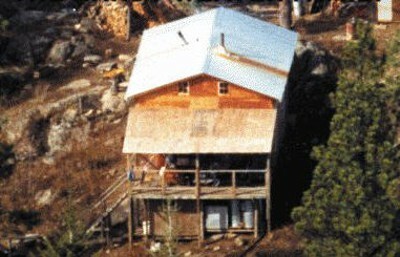 Prior to the killings at Ruby Ridge, the Marshals Service had spent a year and a half spying on the impoverished, isolated Weaver family. This included multiple acts of criminal trespass and the creation of a network of remote-operated surveillance cameras on the high ground above the family’s land. Weaver was considered a fugitive for missing a court hearing after being issued two summonses giving two different dates. He was to stand trial on firearms charges after being entrapped by the ATF, which sought to blackmail him into becoming a federal informant inside the Aryan Nation white supremacist organization. Weaver’s first encounter with the Feds came in July 1985, when he was visited by the Secret Service after a neighbor accused him of threatening the life of President Reagan. Rather than filing charges against Weaver, the Feds opened a file on him. Four years later, an ATF undercover informant-provocateur named Gus Magisano (who used the pseudonym “Kenneth Faderly”) made a business proposal to Weaver: He offered to buy several shotguns from him if the barrels were sawed off to his specifications. With his family practically starving, Weaver was a motivated seller. His customer was an eager buyer – but he was also curiously specific regarding the modifications he wanted on the guns, demanding that Weaver saw off the barrels at a particular length. Those “illegal” alterations – which left the barrels longer than those on the sixty Remington 870 pump-action shotguns ordered by the IRS a few years ago – offered the ATF what it thought was sufficient leverage to blackmail Weaver. 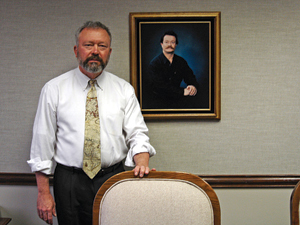 In January 1990, Weaver was visited by ATF Agents Herbert Byerly and Steve Gunderson, who threatened to prosecute him unless he became an informant. To his eternal credit, Weaver invited them to inseminate themselves. 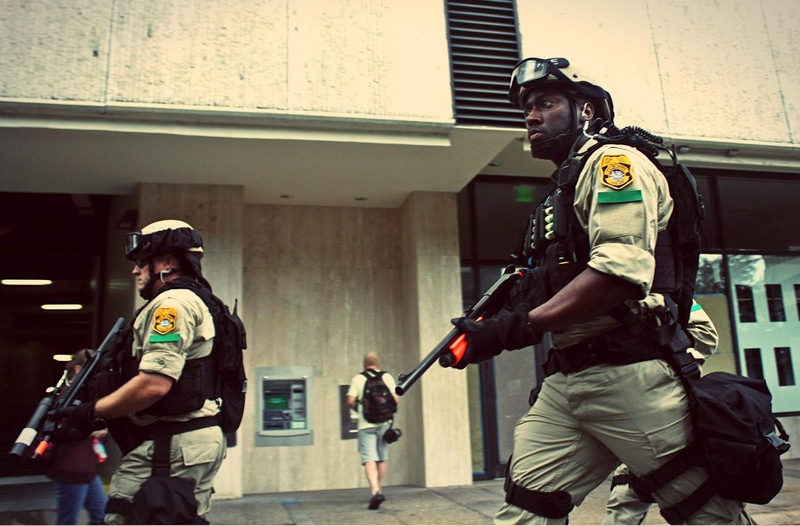 Since defiance of that kind simply couldn’t be tolerated, the ATF, acting with the U.S. 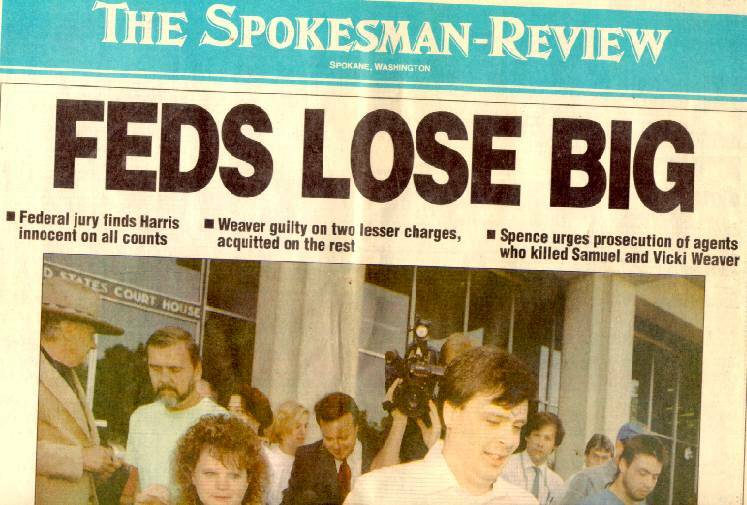 Marshals Service and several state and local agencies, initiated the low-intensity war against the Weaver family that eventually claimed the lives of Vicki and Samuel. Trentadue’s understanding of PATCON is the product of long, arduous investigation of the FBI’s role in inciting domestic terrorism and covering up its officially sanctioned misdeeds. He is a singularly tenacious and motivated investigator: His brother, the late Kenneth Trentadue, was murdered by the FBI in an Oklahoma prison cell on August 21, 1995, after being mistaken for a bank robber named Richard Lee Guthrie, who was part of a PATCON-connected gang called the Aryan Republican Army. Shortly after the April 19, 1995 OKC bombing, Kenneth – who had served time for robbery and was on parole -- was detained in San Diego as he re-entered the U.S. from Mexico. His wife Carmen had family down in Mexico, and Kenney (as his brother calls him) had made a quick trip to visit them down south. Kenney was stopped by a border guard who ran a background check on him. He was arrested and stuffed into a plane bound for Oklahoma City. At the time, Kenney Trentadue was 44 years old, in good health, and trying to rebuild his life. His wife was expecting a child, who was born while Kenney was in federal custody. Kenney assumed that he was being held on a parole violation. He had no idea that he had been snared in the FBI’s manhunt for “John Doe #2,” an unidentified co-conspirator in the OKC bombing. While Kenney was in federal custody, indictments were handed down against Timothy McVeigh and Terry Nichols — as well as “others unknown”— for their role in the Oklahoma City Bombing. That occurred on August 10. Kenney arrived at the Oklahoma City Federal Transfer Facility — just a few miles from the courtroom where McVeigh and Nicholas had been indicted — on August 18. Three days later, he was dead, supposedly of suicide. Kenney’s body was “found” hanging from a bedsheet in his cell. A few hours after this “discovery,” Kenney’s mother Wilma received a call from acting warden Marie Cutler informing her that her son had killed himself. In a fashion suggesting both indifference to the family and a great deal of urgency, Cutler informed Kenney’s mother that the body was to be cremated very soon. Although understandably devastated by her son’s death, Mrs. Trentadue had the presence of mind to demand that no action be taken to dispose of the body without the permission of Kenney’s wife. Cutler was surprised to learn that Kenney was the married father of a newborn son; she had been told he was single, because the killers had mistaken their victim for somebody else. Not only were prison officials indecently eager to cremate Kenney’s body, they were also frantic to sanitize the “suicide-proof” cell. This was a criminal act of evidence tampering. The floors and walls of the cell were mopped and scrubbed; the bed sheet with which Kenney had supposedly hung himself was “lost” or destroyed; most of his clothing ended up in the possession of an FBI agent who –in the finest tradition of that incurably corrupt agency— let it putrefy in the trunk of his car. Within a few hours of the “suicide,” the FBI and prison officials managed to “lose” or destroy most of the critical evidence. Left alone with Kenney’s body, Jesse and his mother peeled away several layers of post-mortem makeup. They found his body riddled with contusions and other evidence of a severe beating, administered by both fists and batons. 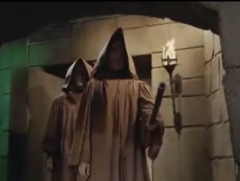 His head had been repeatedly lacerated, and his throat appeared to have been cut. The Bureau of Prisons convened a board of inquiry, and — in keeping with Michael Hood’s promise — slammed the lid down, hard. The attorney heading the probe classified its findings as “attorney work product,” a move intended to foreclose discovery of the material in future court actions. Cover-ups by corrupt officials are commonplace. However, Jesse Trentadue considered it strange that federal functionaries were so anxious to conceal the circumstances of Kenney’s death. Why would the Feds lie about the cause of Kenney’s death, and then spare no effort to destroy all the evidence? Kenney fell victim to a case of mistaken identity of Dickensian dimensions. He was a near-physical match for Richard Lee Guthrie. They were the same age, and shared the same build -- 5’9″ tall and a muscular 180-190 lbs. Each was brown-haired, with a dragon tattoo on his left forearm. Most importantly, Guthrie was a bank robber, as Kenney had been before going to prison. More specifically, Guthrie robbed banks on behalf of the Aryan Republican Army, which conducted some 22 bank heists in the early 1990s and netted about $250,000 to fund domestic terrorism. At the time of Kenney’s arrest, Guthrie was already somewhere in the bowels of the federal prison system. Like Kenney, Guthrie would later be the victim of an anomalous prison suicide: His body was “found” by a guard hanging from a bedsheet. Just before his death in 1996, Guthrie had told the Los Angeles Times that he was writing a memoir that would, among other things, describe connections between the ARA and the OKC bombing. Guthrie wasn't the only other inmate connected to the Trentadue case who would wind up dangling lifelessly from the ceiling of his cell. Alden Gillis Baker, an inmate at the OKC Transfer Center, told Jesse that he had overheard an “altercation” involving “a lot of physical violence” the night Kenney was killed; that was followed by “faint moaning” and the sound of bedsheets being torn. Baker repeated that account in a subsequent deposition that was rejected by a judge. 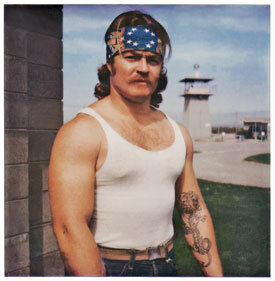 In 2000, Baker was also “found” hanged to death by a guard in a California federal prison. As this body count demonstrates, the Feds were desperate to conceal something genuinely horrible. Jesse’s understanding of the magnitude of the cover up expanded considerably in 2004, when he received — from a sympathetic source at the FBI — two redacted documents proving that the FBI had been aware of a connection between the OKC bombing and the Aryan Republican Army, which in turn was connected to a bizarre white supremacist commune in Oklahoma called Elohim City. That tip primed a Freedom of Information Act Request that dislodged more than 250 pages of documents — all of them heavily censored — confirming that the FBI and other federal agencies (including the ATF, which had planted Carol Howe at Elohim City) had abundant and detailed advance intelligence of the 1995 bombing. As is the case with any significant gathering of white supremacists, Elohim City was a wholly owned subsidiary of the FBI. In addition to Carol Howe (whose cover was blown by her handler when she actually tried to expose those responsible for the OKC bombing), the late Robert Millar, the cult’s patriarch, was also on the federal payroll. The group’s head of security, a dodgy German national named Andreas Strassmeir, has been identified as an intelligence asset for both Washington and his own national government. A hyper-violent Klan activist named Dennis Mahon, who also spent time at Elohim City, was likewise a paid snitch. At least one other individual there was taking notes and passing them along to the Southern Poverty Law Center, a quasi-private secret police adjunct headed by self-promoting fraud and sexual degenerate Morris Dees. At least two ARA members were “part-time” residents of Elohim City, and there is abundant reason to believe that Timothy McVeigh — who called the commune just shortly before the OKC bombing — had collaborated with the ARA in carrying out at least some of their robberies. In 2007, shortly after filing his FOIA request for the OKC bombing videos, Jesse Trentadue contacted by Terry Nichols — who is serving a life sentence for his role in the bombing, and cannot be tried again on capital charges. With Trentadue’s assistance, Nichols filed a deposition in a Salt Lake City federal court. 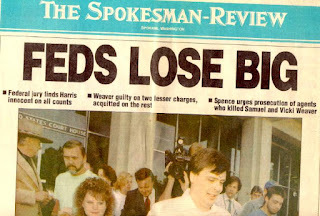 Not only did Nicholes implicate the ARA in the bombing plot, he claimed that McVeigh — who allegedly had been recruited as an undercover intelligence asset while in the Army — had been working under the supervision of Larry Potts, the same FBI official who wrote the murderous “rules of engagement” at Ruby Ridge and later supervised the annihilation of the Branch Davidians at Mt. Carmel, Texas. The Feds weren't pursuing Richard Lee Guthrie for the purpose of solving a crime; they were hunting him as part of a nation-wide drive to tie up loose ends in what was either a criminally inept "sting" operation, or a full-fledged false-flag attack at Oklahoma City. Once Kenneth Trentadue became another loose end, he was tortured and beaten to death -- but his brother, God bless him, was determined to pull as hard as he could on the few frayed threads he could find. “The only difference between the FBI and the KGB,” Jesse Trentadue wearily concludes, “is that the Soviet secret police never pretended to be a legitimate law enforcement agency.” That observation was shared on August 21 – twenty years after federal marshals murdered Samuel Weaver, and the seventeenth anniversary of the torture-murder of Kenneth Trentadue, both of whom were victims of the FBI’s ongoing PATCON initiative. ... to everyone who has participated in the Pro Libertate moneybomb. We deeply appreciate your generosity. God bless!